No sooner did I return from my vacation than I hit the road again. Today’s Wall Street Journal drama column is devoted to reviews of two out-of-town musicals, Sunday in the Park with George in Philadelphia and Annie Get Your Gun in Connecticut. Both are top-notch, must-see shows. Here’s an excerpt. For all the prodigal virtuosity of his wordplay, Stephen Sondheim is first and foremost a composer. It is his music that makes his shows unique, and it troubles me that so many of the small-scale Sondheim revivals to come along in recent seasons have fallen down on the musical job. Not so the Arden Theatre Company’s sterling mounting of “Sunday in the Park with George,” in which Mr. Sondheim and James Lapine spin a tale of love, loss and artistic commitment out of the creation of “A Sunday Afternoon on the Island of La Grande Jatte,” Georges Seurat’s 1886 pointillist masterpiece. Not only is this production sensitively staged and imaginatively designed, but it’s the best-sung Sondheim revival to come along in years–and it makes use of Michael Starobin’s ear-caressingly iridescent original 1984 orchestrations, which are among the finest ever to be created for a Broadway show. The program gives joint credit for the concept of this production to Terrence J. Nolen, the director, and Jorge Cousineau, who created the video projections that bring “Sunday in the Park with George” to arresting visual life. On a stage designed by James Kronzer to look like a triple-matted print hanging in an art gallery, we see the sketches from Seurat’s notebooks on which “A Sunday Afternoon on the Island of La Grande Jatte” was based, along with countless other striking effects. What is most impressive, though, is that none of these effects is ever allowed to get between the actors and the audience: Instead of overwhelming the show, they serve it…. No two musicals could be more unalike than “Sunday in the Park with George” and Irving Berlin’s “Annie Get Your Gun,” a make-way-for-Merman blockbuster with a score that piles hit atop hit and a charmingly cartoonish book by Herbert and Dorothy Fields that is as child-friendly as a sandbox on a sunny day. Now Goodspeed Musicals is putting on this well-loved show as a vehicle for Jenn Gambatese, who made a splash in “All Shook Up” and “Tarzan” but has yet to emerge as a name-above-the-title musical-comedy star. 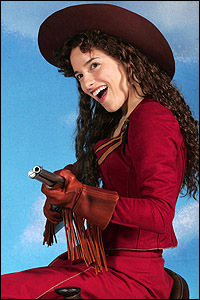 If Rob Ruggiero’s terrific production were running on Broadway, it’d surely do the trick: Ms. Gambatese has a platinum-plated voice and a smile warm enough to sell tickets all by itself, and she plays Annie Oakley, the sharp-shooting backwoods gal who cain’t get a man with a gun, with an affecting blend of brassy boldness and unexpected vulnerability. This is the kind of performance on which whole careers are built…. The Pasadena Symphony is the latest regional orchestra to get itself into financial hot water. It won’t be the last. So many second- and third-tier American orchestras are currently struggling to survive that I’ve been asking myself, not for the first time, whether such institutions may possibly have outlived their artistic usefulness. Do regional orchestras make artistic sense now that the ubiquity of downloadable digital music has rendered obsolete their historic function of bringing classical-music masterpieces to smaller communities? Or can these floundering ensembles be successfully “repurposed” for the twenty-first century? These tough questions are the subject of my “Sightings” column in Saturday’s Wall Street Journal. If, like me, you wonder whether and why regional orchestras ought to be saved, pick up a copy of Saturday’s paper and see what I have to say.